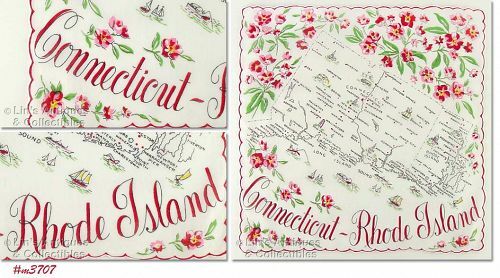 This listing has an excellent condition souvenir hanky for two states – Connecticut and Rhode Island! It is a Franshaw production. Excellent condition souvenir hanky for Iowa and is a Franshaw production! Lovely souvenir hanky for Minnesota! It is a Franshaw production and is in excellent condition. This souvenir hanky for Michigan is a Franshaw production and is in excellent condition! 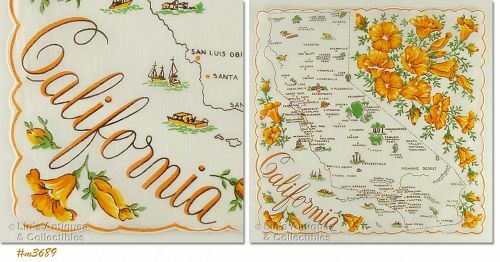 Lovely orange blossoms on this California souvenir hanky! It is a Franshaw production and is in excellent condition. Excellent condition 1961 calendar hanky! It measures 13” x 13” and has hand-rolled and hand-stitched hem. Super! Another excellent condition Christmas hanky! 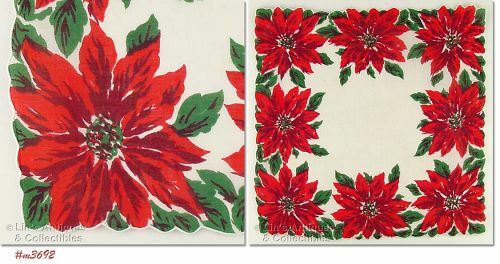 It has 8 large red poinsettias and measures 12 ½” x 12 ½”. Gorgeous! 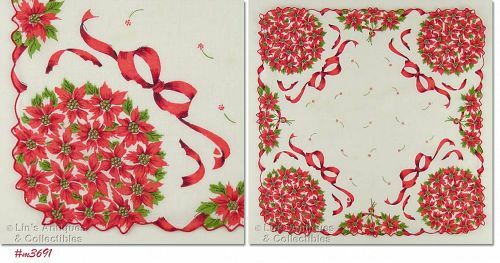 Excellent condition Christmas hanky! It’s white with bouquets of poinsettias and measured 14” x 14”. Pretty! 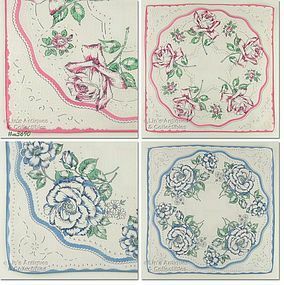 I’ve listed these hankies together because they have the same design but in different colors! 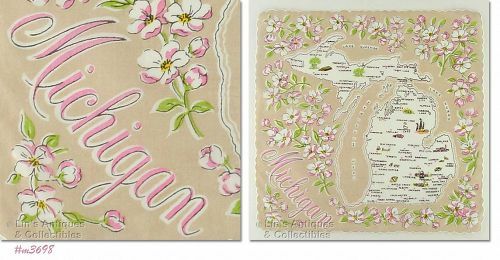 One is pink, one is blue, and both have a design that has the appearance of lace. Hankies measure 14” x 14” and are in excellent condition. Wouldn’t these make beautiful throw pillows? 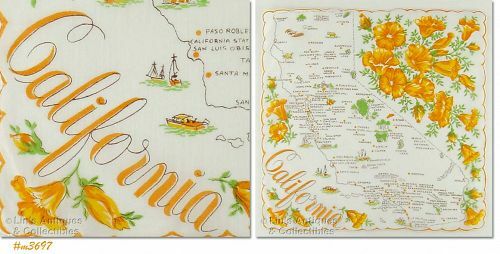 Excellent condition Franshaw souvenir hanky for California! Handkerchief has pretty orange blossoms. 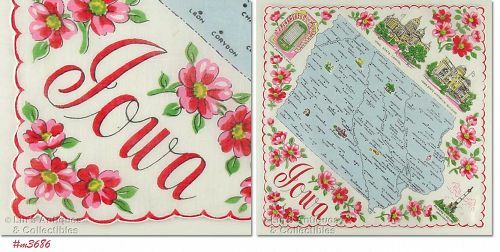 Excellent condition souvenir handkerchief for Nebraska! It’s in excellent condition and is a Franshaw production. 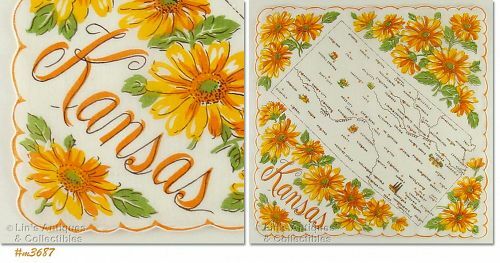 Lovely souvenir hanky for Kansas! It’s in excellent condition and is a Franshaw production. Another excellent condition Franshaw souvenir hanky for Iowa! Lovely souvenir hanky for North Dakota! It’s a Franshaw production and is in excellent condition. Another difficult to find state souvenir hanky! This one is Connecticut, is a Franshaw production, and is in excellent condition. Excellent condition souvenir hanky! This one is for the state of Louisiana and it’s a Franshaw production. 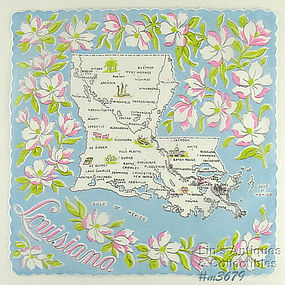 This is another souvenir hanky for two states! It is for the Dakotas, is a Franshaw production, and is in excellent condition. Another excellent souvenir hanky for the state of Massachusetts! This is a Franshaw production.